People from childhood beckons in that element, for which they were not originally created by nature - in the sky. But it is possible to realize a dream of flying like the bird. Paragliding allowed humans themselves up in the air, using hot and cold streams of wind. Heroes of the article say that gave them the sport. From childhood I dreamed to fly. Even wanted to be a pilot - but not developed. When the opportunity to enroll in a paragliding club - immediately took advantage. Classic Sports is not a hindrance paraplaneri ZMU: it can be perfectly combined with swimming though, even with the dancing. And in fact - paragliders athletes are not so much. Many fly "for themselves." Where else can feel free in a guy? Almost on a par with the birds. And it's not boring, with each flight comes a new and interesting experience, and, apparently, a ceiling in this skill is almost not there. This is especially important for me: usually throw something to do when it gets bored, or conversely, when natykaeshtsya insurmountable difficulties. For the first time talked about paragliding in the 60's of last century in the United States. This invention is owned by an American engineer David Barish, who created an entirely new parachute for a safe descent to earth of spacecraft. Pump tested the novelty, but a demonstration of "hovering above the slope does not instill confidence, and from her time off. Later, as it happens, the idea went to the people, and she gladly used the skydivers looking for new experiences in the air. After some time the invention Barish has been modified: it osnastilii profile, suspension lines and slightly elongated wing. So the light will the world's first glider. Everything started with the skydiving ... Then I realized that I like to stay in the air, like the feeling of freedom that occurs when the firm disappears under the feet of the surface. Around the same time, friends were going to go study in the paragliding school, and invited me along. I'm not very well represented at the time that it is, but the prospect of flying like a bird looked very attractive. And I went. My expectations are more than justified. To the glider can fly for a long time and overcome hundreds of kilometers. I would not say that I was one paragliding as a sport ... We, of course, there are athletes, bits, contests and records, but for me it is something else, it's like a parallel life, it has its own laws, where you strive to prove themselves, well, just up there, very free and beautiful! From many of the pilots I have heard that when you get in the air, all your problems, feelings as if still on the ground, and you seem a little bit different person, more happy that I ... Another involves the fact that you can fly over these places (usually in the mountains), to which the foot is never reached. p style = "text-align: justify;"> Today, paragliding, or, as it is called professionals, paragliding, is not considered an extreme sport. Trauma associated with it, as a rule, sprains and bruises, so the management glider can be put on one scale with the cycling - if you do everything right, then the fall can be avoided. Maximum speed of the glider is about 40 km / h, it easily fits in a backpack and weighs about 5 kilograms, or almost 3 times less than the weight of a parachute, so do paragliding can be almost anyone who has attained 16 years of age. Hope: A distinctive feature - paragliders often look to the sky, studying the clouds, wind, and very carefully watch the forecasts, but still they can without stopping for a few hour s talk about their flights. All of our brethren are very friendly, with each other willingly help, advise, monitor the safety of others. You can find us on paragliding pictures on T-shirts, cars and other things. For learning hovering, there are special schools, a choice which should consider the following points. First, pay attention to the number of students in the group - it should not exceed 8 people per instructor. Learn about the equipment available - preferably by parachute on each, and finally, the possibility of contact with the instructor. During the flight you definitely need a kind of "radio nurse - walkie-talkie radio, with which you will communicate with your coach. From the clothes you need high laced boots (to eliminate the risk of various contortions when landing) and a strong lightweight helmet with holes, through which you will listen to the wind and the instructor. If you want to protect yourself from scratch, we should also wear trousers and a jacket with long sleeves. Hope: My club is in Zhukovsky (club "Horizon"). Our training places - in the winter in Ramenskoye, Chulkov, at other times in Tatarintseva. Yet we have had visits by Ryazan, Ukraine, Austria and Montenegro. In Moscow, as far as I know, beginners can engage in Kolomna. For beginners I recommend to train in a specialized school, such in the Moscow region abound. Self we are not welcome, because often at stake is not only the security of a self-taught, but the pilots who surround him. A seasoned athlete - to expand their horizons with new flying sites. 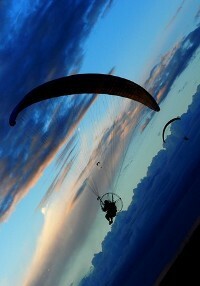 The main condition for paragliding lessons, of course, is a breeze. But the thing to remember is that it can both help and hurt you. The most common athletes start from the slopes of hills and mountains, using bottom-up dynamic flow, which occurs when wind collision with an obstacle, and only to gain enough altitude (3500 m), go to the route, using thermals generated from a temperature difference of air masses. High mountains in Russia, unfortunately, a rarity, so now gaining popularity deltadromy. There, for the climb they use winches, which are divided into passive - using vehicle speed and activity, which have their own engine. One such deltadromov located in the village of fishermen, Moscow Region, which like all its counterparts located away roads, various buildings, tall trees, power lines, in order to protect the paraglider from unnecessary risks. In addition to schools, there are also special one-time certificates for flight.The cost of such a "ticket to heaven" varies from 1500 to 2500 rubles per person. By the way, most organizations that offer this service period of the certificate about six months, so you can easily make a gift right now, and conquer the height to go warm summers. Hope: When I started, my parents were not against: just the beginning nobody believed seriously that I'm capable of this. Then, when the actual flight, they became much experience, every time discouraged to go to a match ... But n Otomi accustomed to, I explained to them that we take all security measures and the organization of missions and equipment. Maxim: Hobby dangerous - sometimes parents are discouraged ("Well, when are you povzrosleesh, and others in the same way ...) The family sometimes worry, do not like stories like:" ... and then I ka-ak folded !..". But in general, obstacles, of course, no one builds. And friends, probably, does envy.